On the High Holy Days, as well as on the Sabbath and at weddings and bar mitzvahs, yarmulke-wearing males share an ancient and universal problem: how to keep their skullcaps on their heads. Bobby pins are used by everyday wearers of kippahs. This solution is not ideal, as bobby pins tend to get lost. A Brooklyn Rabbi, Sholom Ber Schapiro, in search of a sophisticated scientific solution to the skullcap-slippage problem, contacted an Israeli scientist, Herman Branover, at the Beer-Sheva University of Negev, whose field is magneto-hydrodynamics. Branover referred the rabbi to his friend from Russia, BNL Mechanical Engineer Lev Neymotin, Department of Nuclear Energy (DNE). Rabbi Schapiro suggested the use of glues or magnets, but Neymotin immediately thought of a simpler, mechanical fastener: Velcro. After consulting with the manufacturer of Velcro and experimenting with various Velcro samples, "Kippon" was begotten in 1986. It is an ingenious product with a clever name, to keep your kippah on. NEW YORK TIMES, November 9, 1986: "Take the Kippon kit. Conceived by Lev Neymotin, a nuclear physicist from Long Island, it is intended to hold yarmulkes firmly in place with four strips of Velcro (TM) that grab hair but release gently. Mr. Neymotin, who is usually occupied with the safety of nuclear reactors at the Brookhaven National Laboratory, said in a telephone interview that the product's name was a play on "keep on" and "kippah," the Hebrew word for yarmulke..."
"I've been using your product for several years and am very satisfied and will be until I go bald! 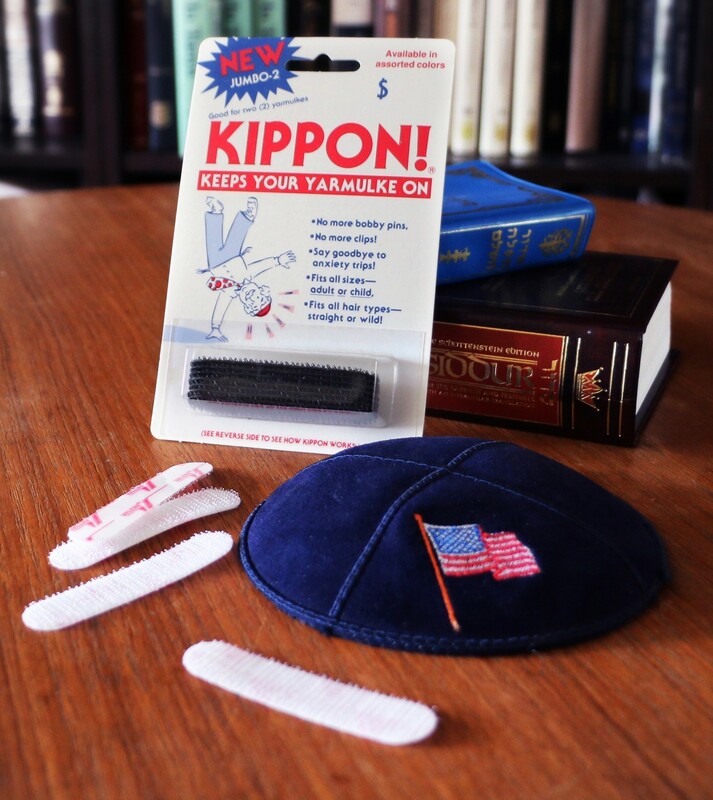 (G-d forbid)..."
"Your product Kippon recently came to my attention and I am thrilled with it!... When I do weddings and Bar Mitzvahs, these are really quite in demand!.." "Unlike so many such items, it really works and my husband is sold on it..."
"I picked up your new Kippon, and I think it's terrific..."